Don't just take our word for it, check out what some of our guests had to say. "The place was way bigger than we expected, there was twenty in our group and we were never stuck for space. The kitchen has a good layout so it made the meal times very easy for our large group, the eating area was able to accommodate all of us at the same time as well. The games room had the table tennis table in it which ensured some competitive entertainment. Outside had 3 tables with 20 garden chairs which was perfect for the sunny weekend we were lucky to have and the garden is big enough for some games we brought with us, boules and badminton. Nearby there are shops and pubs within a 5 minute walking distance. Cahir is also the town nearby with lovely shops, cafes and pubs (the Lazy bean cafe would be a recommendation of ours). The Mitchelstown caves are only a 15 drive which we would recommend to anyone visiting (€9 entry pp). Last but not least the host, Before arrival There was good contact and some helpful tips. When we arrived Garry showed us around and told us what we needed to know about the house and the surrounding area. He was so friendly and was always available to help us out with anything. Would recommend this to all groups whether it be family gatherings or groups of friends. 100% will come back!" "One of the best hostels I’ve ever stayed in. Beautifully restored building converted in to a stylish and functional hostel. Our group of 20 thoroughly enjoyed our stay and would highly recommend to anyone heading to that part of the country or looking for a place for a large group to get away to." "I recently had the pleasure of staying at The Sallows. Its located in the heart of the Golden Vale surrounded by the picturesque scenery of the Vee Valley and the knockmealdown mountains.The rooms were spotless, warm, comforable and spacious and the decor and surrounding. helped add to the tranquil and relaxing atmosphere. This is ideal accommodations for families and groups. **Would highly reccomend to anyone looking for a quiet getaway** Anne." "Luxury Hotel Standard Eco Hostel"
"A group of 20 of us stayed here for the Easter weekend and had a great time in the beautifully restored eco-conscious hostel. Gary and his family have done a great job in creating a destination that is kind to the planet without scrimping on the comforts. Easily the best hostel I have ever stayed in and there's even a ping pong table which kept the group entertained for hours. I would recommend this to any groups wanting to explore the surrounding area. We'll be back for sure." "A group of us stayed in The Sallows this weekend and I couldn’t recommend the place enough! When we checked in the stove was lit for us and the place was spotless and had a very homely feel to it. We had the games room to play table tennis and the kitchen is kitted out with everything you could possibly need. The attention to detail that was put into all aspects of the property was hard to miss. The beds were class and the communication with staff and the booking was seamless. We will certainly be back and I couldn’t recommend The Sallows enough. Thanks for a great weekend!" "Myself and my Fiancee stayed at the Sallows on Saturday night and had a brilliant experience. I have stayed in plenty of hostels over the years and this was definitely one of the nicest. Very clean and cosy, and the beds were very comfortable, we loved the art work and photographs and we especially loved the wood stove in the living room which Gary kindly had prepared for us. Gary is a great host and is very passionate about the local area and the restoration of old buildings, it was brilliant to learn a few things about the local area and the conservation work gone in to the building. Gary went to great lengths to provide modern luxuries in an old Irish home without tearing flooring and walls apart in the process. It is also a very eco friendly hostel and it was great to get a few tips about this. There are plenty of walking trails close by, you also have the Mitchelstown caves, Ballyhoura mountain biking trails and plenty of castles to go view too. If you want to see the midlands or Munster Vales this is the location to stay." "I had occasion recently to stay at The Sallows as part of an organised course. I fully expected 'the hostel experience' of crumby counter tops and lumpy bunk beds. Instead, I was pleasantly surprised on being greeted with pristine surroundings within a sensitively and lovingly restored historic building, all the work of Garry, an interesting and very pleasant host! The hostel was ideal for our small group as there is a meeting room, a high quality kitchen and dining area and a very comfortable relaxation room. We were also able to make use of an outside eating area as the weather was good. There is a small amount of parking available on site. All in all, a delightful hostelling experience that I would highly recommend to similar groups seeking this kind of accommodation. Check out The Sallows!" "A group of 20 of us went to The Sallows this past weekend. The place was amazing, kitted out with everything and anything you could possibly need and was extremely homely and comfortable. We didn't venture out either night we were there because we had everything and more that we could possibly want within the house! Just a short trip to Michelstown Caves, this place shows the real rural Ireland and would be great for large groups/hens/stags!" 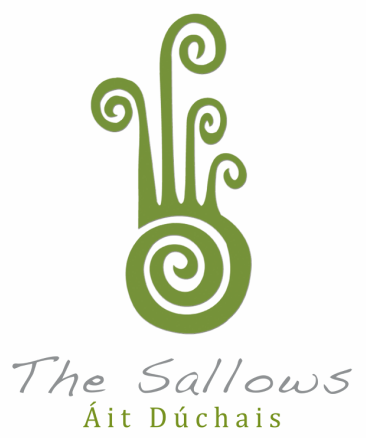 "The Sallows was the perfect place to accommodate a group of 20 people. When we arrived we were greeted by the host Garry, who was very friendly and helpful over the course of the weekend. It was instantly clear that The Sallows is a very recently renovated and modern building. The combination of a gracious host, comfortable beds, modern appliances, a spacious living area, plenty of parking and even a table tennis made The Sallows the perfect spot for a getaway with friends and somewhere I would definitely return." "Myself and 19 friends went to the sallows for a social gathering and we were amazed at the standard of this visit. The photos you see online don't do it justice! From the garden rugs to throw around you when you are cold to the table tennis, all the touches greatly enhanced our unforgettable trip to the sallows. Our host, Gary, is such a gentlemen and so so helpful. The cleanliness is very very good and the building itself is so modern. There are off-licences and local shops within 3 mins walk away. We visited the mitchellstown caves on our stay which are only a 20 mins drive away (definitely worth a visit)." "We stayed in the Sallows for the weekend with a group of 19 of us and couldn't be happier with our choice to stay here. There is so much space, very comfortable, everything is absolutely sparkling clean and brand new! Gary the owner was the nicest host, very accommodating and gave us a thank you card when we were leaving. We will 100% be back!!" "This was my second visit here, both times with a large group from SARDA Ireland, and was hugely impressed both times. It's bright, clean, airy, warm and modern with all the facilities you could wish for. The dormitories are lovely and warm, with comfortable bunk beds and duvets. A modern well equipped kitchen rounds it off. I'll definitely be back." "I recently stayed at The Sallows along with a large group. It was a fantastic weekend. The accommodation and facilities are of the highest standard with great care taken on every detail. The beds were very comfortable and the rooms extremely quiet and warm thanks to the building design and smart temperature regulation. The Sallows has a great kitchen and two break out areas - ideal for unwinding. Nearby is the Vee, a beautiful mountainous area ideal for hikers, cyclists and motorcyclists. As a motorcycle enthusiast, I have already planned a return trip with another group and will base ourselves here. A point worth noting is an out door dry room which would be extremely handy for wet gear after a day's riding. Also there is gated parking to keep our minds at ease while our bikes sleep. Overall, this was a fantastic experience and I look forward to my next stay." "Stayed here with a group of lads for a stag weekend. Very comfortable, warm and spacious for a large group, excellently furnished and plenty of communal areas for activities on the ground floor. The hostel is a great base for touring the area, with lots of scenery and exploring to do nearby. Highly recommend and would love to stay here again." "We had a lovely weekend at The Sallows when we were in Tipp recently. The beds were very comfy (I had a great night's sleep) and the facilities were pristine! My partner and I had a lovely stroll along the river bank one evening and the proximity to the Vee Valley for hiking was very convenient :) Gary and family were very welcoming and had lots of interesting stories to share about the history of the house and the local area. Thanks for a wonderful trip - we will definitely be back!" "Not only was this an amazingly clean and modern facility...the grounds are pretty....the scenery is beautiful and the owners; Garry, Caroline and Gemma, are the most wonderful and kind people you could ever ask for. I highly encourage all people to stay at The Sallows. It is a far cry from being a typical hostel.....it is a beautifully renovated home that is very comfortable and inviting. Kudos to the Gleeson family and I hope for immense success in your endeavours." "Me and 19 friends had an amazing weekend here. There was plenty to do and see but we would have been more than happy to stay in and play table tennis for the weekend! Gary and his family were so friendly and welcoming. Thanks so much "
"Over the last 35 plus years I have spent a lot of time in bunk houses and hostles. This is the most comfortable and best I have stayed in to date. Spotless clean, spacious and cleverly decorated throughout. Well worth a stay for night or weekend." "Amazing place to stay!! A big group of us stayed here for the weekend and it was amazing! So clean and modern with everything you need! Would definitely recommend!!" "Perfect for a group getaway! Owners couldn't be nicer and are a lot of help! Also close to the Mitchellstown Caves and just an hour away from the Middleton distillery if you like whiskey!" "Brilliant hostel, would highly recommend." "Was here recently with a large group from SARDA Ireland, and was very impressed. More like a 4 star hotel than a hostel. Very clean, warm and comfortable, with a well equipped kitchen that would put many people's kitchens at home to shame." "Beautifully renovated and really friendly place. Great location to." "One of the best quality hostels I have ever stayed in. A real retreat." "I brought some friends to stay here and what an experience they had. Gary and Clare were great with communication from the start. When they arrived the stove was lit and it had a real “home” feel. They have stayed in many hostels previously and said that the Sallows was by far the best they had stayed in. They will be returning! Thanks again." "Excellent value! This hostel is very clean and comfortable. It's very well equipped and really well located." "I have stayed now in The Sallows twice and will be back again soon I hope. So close to the mountains for walking and Kilkenny city. A beautifully restored building with every modern convenience you would ever need. Plus the most comfortable beds ever! Thank you Garry for your wonderful welcome." "I was completely enchanted with this wonderful place. I would give it 6 stars if I could!" "Exceptional standard hostel...in top 5 of any I have ever stayed in." "Love this spot they did some job on the building and it is so new and spotless I wouldn't even compare it to any other hostel...this is a GLOSTEL!! Ideally located, spacious and eco-friendly it's ideal for any group. We used the training rooms and it was absolutely perfect for our requirements. Thanks for a great stay!" "Fab hospitality & gorgeous building."